Bitdefender, online at Bitdefender.com, is your online resource for antivirus software. Bitdefender sells internet security software and antivirus software for home use, including software for Macs and PCs. Some of the software includes: Bitdefender Total Security 2012, Bitdefender Internet Security 2012, Bitdefender Antivirus Plus 2012. Online at Bitdefender, you can also receive access to business trial versions and a free online virus scan as well as free virus removal tools. RetailSteal.com has the best Bitdefender coupon codes, Bitdefender discounts, Bitdefender coupons, and Bitdefender promo codes. Shipping and handling rates at Bitdefender depend on the pricing of your purchase and your shipping destination. See website for full details. Some exclusions may apply. Use this coupon code at BitDefender.com for 15% off your order. Click link to shop and save on internet security solutions. 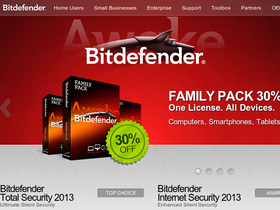 Buy BitDefender software for 3 PCs and save 30% over the 1 PC price. Get BitDefender.com for up to 10 PCs and save up to 70% with volume discounts. Click link to download a free trial of Antivirus Plus 2013 from BitDefender.com. Act now and take advantage of a free trial download of Internet Security 2013 software from BitDefender.com. Get Antivirus Plus 2013 from BitDefender.com for just $39.95 for one computer. Secure your computer with BitDefender Internet Security 2013, now from only $49.95 for just 1 computer. Check out BitDefender.com and get Total Security 2013 from as low as $69.95. Click link. Save 10% on your Bitdefender Total Security purchase when you enter this promotional code at checkout! Save 25% on any BitDefender service or purchase when you use this promotional code!